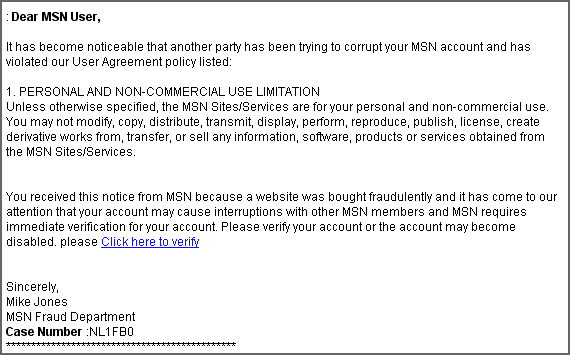 When it goes on to suggest that 'another party has been trying to corrupt your MSN account ' it adds extra impetus to follow the instruction to use the link provided to rectify the situation - and therefore secure your account for fear of fraud (see images below). The link that is provided is cloaked (disguised) and it will take you to a fake MSN/Hotmail page which contains a form for you to provide vital information, including Hotmail or MSN username and password, credit or debit card and bank details (see images below). The fake page is hosted on web servers located in China, so Microsoft will no doubt find it hard to have it closed down quickly. Expect to be seeing this email scam for a little while yet, so make yourself familiar with the images we've taken and shown below. Any information that you enter into that form, and then submit, is captured for the scammers, or fraudsters via neveru.nl's form to email service, while you are diverted to a genuine MSN & Hotmail page - by which time, your account and private information is no longer privy to just you and MSN or Hotmail. If you have received this hoax email, please remember that it is very common for these email scams to be redistributed at a later date with only slightly different content or the same but with the fake page(s) hosted by a different provider. Also, once you have received one of these hoaxes, it is also common place to receive at least another one and usually a day or two after the first, although not necessarily from the same apparent sender. Take a good look at the following images, because this hoax email scam may be coming to an inbox near you!